This article is about a topographic term. For meetings between heads of state, see Summit (meeting). For other uses, see Summit (disambiguation). A summit is a point on a surface that is higher in elevation than all points immediately adjacent to it. The topographic terms acme, apex, peak (mountain peak), and zenith are synonymous. The term top (mountain top) is generally used only for a mountain peak that is located at some distance from the nearest point of higher elevation. For example, a big massive rock next to the main summit of a mountain is not considered a summit. Summits near a higher peak, with some prominence or isolation, but not reaching a certain cutoff value for the quantities, are often considered subsummits (or subpeaks) of the higher peak, and are considered part of the same mountain. A pyramidal peak is an exaggerated form produced by ice erosion of a mountain top. Summit may also refer to the highest point along a line, trail, or route. The highest summit in the world is Everest with height of 8844.43 m above sea level (29,029 ft). The first official ascent was made by Tenzing Norgay and Sir Edmund Hillary. They reached the mountain`s peak in 1953. Whether a highest point is classified as a summit, a sub peak or a separate mountain is subjective. The UIAA definition of a peak is that it has a prominence of 30 metres (98 ft) or more; it is a mountain summit if it has a prominence of at least 300 metres (980 ft). Otherwise, it's a subpeak. 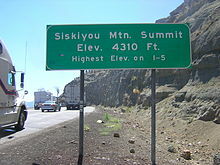 In many parts of the western United States, the term summit refers to the highest point along a road, highway, or railroad. For example, the highest point along Interstate 80 in California is referred to as Donner Summit and the highest point on Interstate 5 is Siskiyou Mountain Summit. A summit climbing differs from the common mountaineering. Summit expedition requires: 1+ year of training, a good physical shape, and a special gear. Although a huge part of climber’s stuff can be left and taken at the base camps or given to porters, there is a long list of personal equipment. 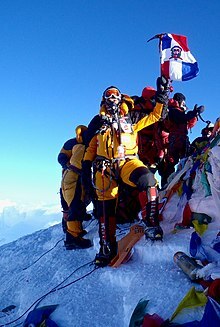 In addition to common mountaineers’ gear, Summit climbers need to take Diamox (anti-altitude sickness medication), masks, and bottles of oxygen. There are also special requirements for crampons, ice axe, rappel device, clothing, etc. ^ Lyons, Kate (2017-05-21). "Mount Everest's Hillary Step has collapsed, mountaineer confirms". The Guardian. ISSN 0261-3077. Retrieved 2017-12-10. ^ "Everest". National Geographic. Retrieved 2017-12-10. Wikimedia Commons has media related to Summits.